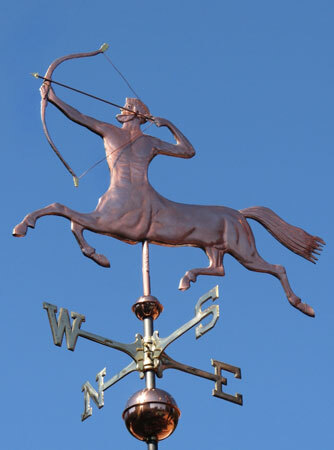 The Pegasus Weather Vane is a popular early design crafted in all copper or in a combination of copper and brass. We can also add optional gold or palladium leaf to his mane, wings and tail. Each customer can select from different colored translucent jewels for his glass eyes. As shown here, he was made as a copper horse with optional gold leaf on his mane, tail and middle wing panel. Pegasus is a perfect candidate for a weathervane. What better place is there to see a Winged Horse than up in the sky above your home? If you want to take full advantage of your Pegasus Weathervane, you could even train lights on him at night so you can watch him soar across the dark sky! Because Pegasus has a constellation named after him (the Pegasus Constellation, natch’) he is a well known figure in the northern night sky. Pegasus was one of the 48 constellations listed by the 2nd-century astronomer Ptolemy, and remains one of the 88 modern constellations. 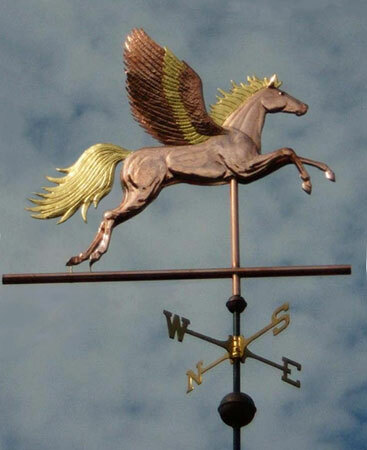 Our Pegasus Weathervanes reside atop guest houses, barns, gazebos, even a plantation house in Alabama and a spectacular horse ranch in British Columbia, set against a backdrop of the Canadian Rockies. 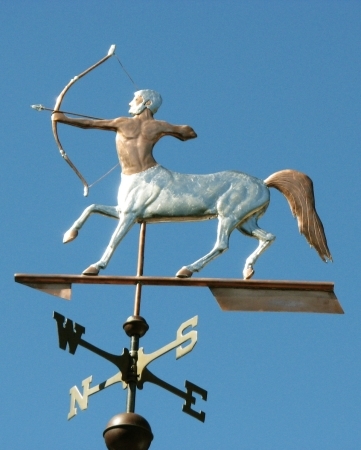 One customer paired her Pegasus weathervane with a Jumping Horse Weathervane. A customer in Houston, whose family was in the oil business, liked our Pegasus because it reminded her of the iconic Pegasus used long ago as a logo by Mobil Oil. 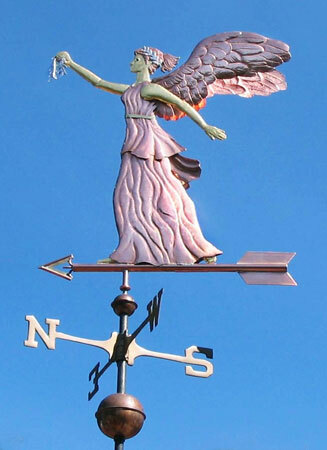 Figures from Greek and Roman mythology are popular designs here at West Coast Weather Vanes. 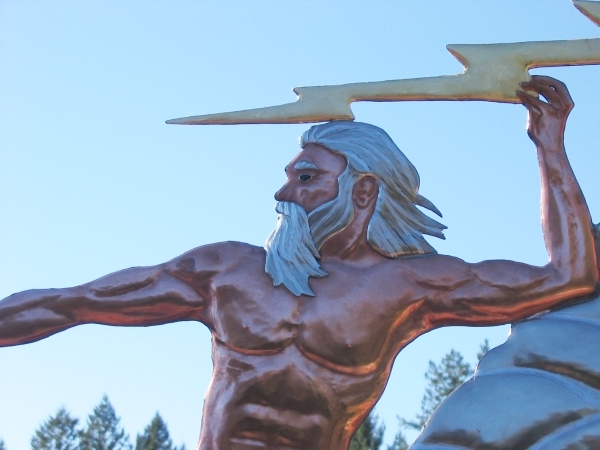 In addition to Pegasus, we offer Poseidon weathervanes, Zeus weathervanes, Nike, Centaur and even a Trojan warrior weathervanes. 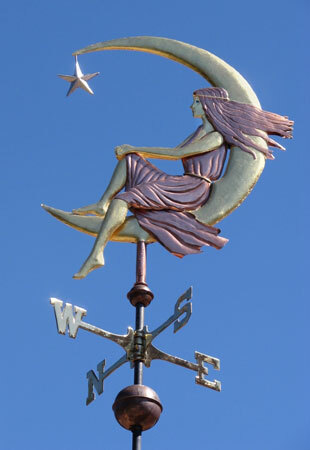 We’ve always thought Diana, as The Huntress, would make a spectacular weathervane. 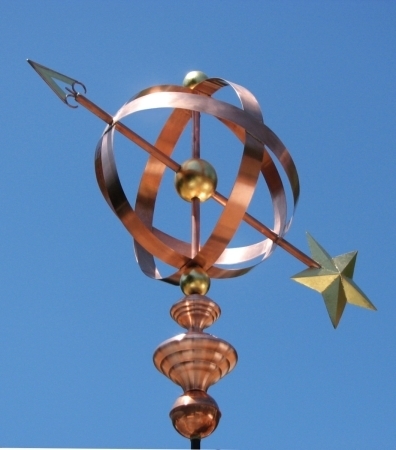 If you have another favorite hero, god or magical creature from a mythological tradition you would like to see made as weathervane, please let us know. It would be a pleasure to work with you on such a project.